Ovaltineys Card | The Dacorum Heritage Trust Ltd. The Ovaltineys advertising post card aimed at children. The idea was that a child would colour the lower half of the card and then post to a friend, a little like inviting a Facebook friend to Like or follow a page that you are interested in or want to promote – the old fashioned version of social media. Ovaltine was at the forefront of advertising, utilising new techniques when they became available. The company was one of the first brands to be promoted when commercial television launched in 1955. 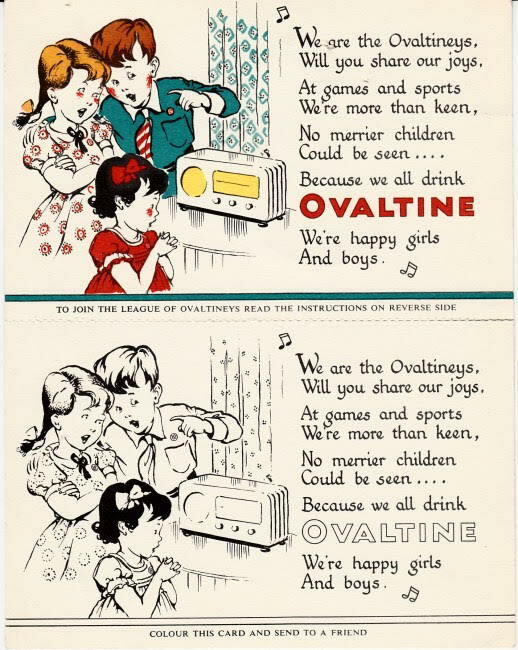 In 1935, Ovaltine launched ‘The Ovaltineys‘, a family radio show which aired on Radio Luxembourg. The song ‘We are the Ovaltineys‘ became one of the most famous jingles of all time. By 1939 there were over 5 million members in ‘The Ovaltiney League’. The programme halted when Radio Luxembourg closed transmission at the outbreak of the Second World War, but it reappeared in 1946, to run on for several more years. The club re-launched in the late 1960’s with the comedy duo Morcombe and Wise as its Presidents.